An amazing A-frame house where everyone feels welcome! There's even access by way of the roof, sides, and front sliding doors. 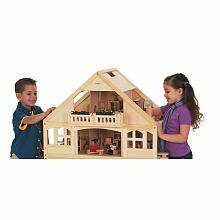 Enormous two-story dollhouse with 6 rooms. 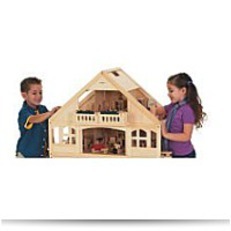 More floor space and larger rooms makes play comfortable for the little hands. The upstairs balcony has 2 rows of colorful flowers also as the roof features a built-in handle for easy carrying.